Are we good at spreading democracy? Do we have reason to be confident? Or is rethinking our approach long over due? Americans are passionate about democracy. Supporting democracy is as American as apple pie. America stands for democracy. That could be America’s motto. It might be the one thing left and right both agree on these days. America isn’t alone in this regard. Our democratic friends in Europe and around the world are largely the same. From the beginning of America we’ve always taken the same approach. We focus on the leaders. We emphasize political freedom. We advise countries to hold elections as soon as possible. That is the approach we have taken for 200 years. Is it working? What if we’re wrong? What if this is the wrong advice? What if we are taking the wrong approach to spreading democracy? Who wants to be wrong for 200 years? Democracy is rare. Only 15% of the people in the world—1.2 billion out of a total global population of 7.4 billion—live in a prosperous, free, functioning democracy. The rest live in relatively poor countries that are either completely non-democratic or highly dysfunctional democracies. Plus, according to Freedom House, a non-governmental organization that tracks and studies democracy around the world, democracy has actually been in decline for the last ten years. To summarize the current situation when it comes to democracy, we haven’t made much progress and aren’t moving in the right direction. If democracy were easy, there’d be more of it. Plus, remember, we’ve had some fairly miserable direct experience, and quite recently. Remember Iraq and Afghanistan. We made them have elections and nothing even close to democracy resulted from that. There was even the Arab Spring—out with the dictators, in with democracy. That was the sales pitch. Actually, one dictator was traded for another and democracy never saw the light of day. 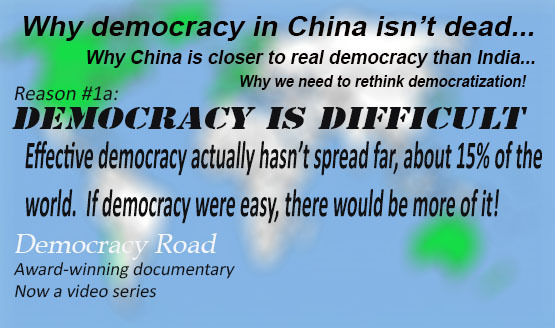 If you think we’re crazy in saying democracy in China isn’t dead yet or that it is ridiculous to suggest China is closer to democracy than India, my question is, why are you so confident?